New rule: I am no longer allowed to watch scary stuff even during daylight hours. As a kid, I loved all things creepy and Halloween-ish. By flashlight, I excitedly devoured yellowed, dog-eared copies of The Exorcist, The Amityville Horror and Helter Skelter that I found under the attic eaves of my family’s remote cabin. Tales from the Crypt was my favorite T.V. show and I couldn’t get enough of horror flicks. I came by these macabre fascinations honestly. If you ask my mother her favorite horror movie she’ll proudly reply, Rosemary’s Baby and she’ll be quick to tell you that she was so enamored with the film when it came out that she decorated her first kitchen to look like Mia Farrow’s kitchen in the movie. She’s one of a kind, my mom. As I’ve grown older, I’ve developed a reticence toward such material. All it takes is a few seconds of a spooky soundtrack and I’m out. I can’t do it. Yesterday however, in honor of the season, I thought I would attempt to return to my roots and I decided to watch the first episode of the latest season of American Horror Story. It was 4pm on a Sunday and I decided that surely no harm could come to me or my psyche at that early hour. I was wrong. I had disturbing dreams all night. It doesn’t help that my dear mother bears a passing resemblance to Jessica Lange in real life. Needless to say, I woke up feeling twisty. I know that some people have a higher tolerance for horror and that their love of dark subject matter may influence their decorating. 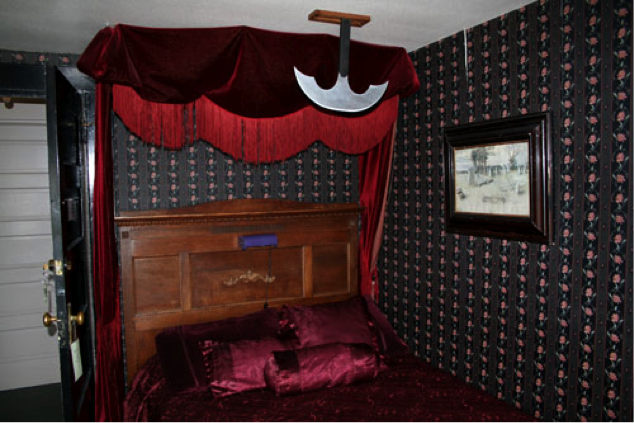 Here are some examples of the creepiest bedrooms I could find- may they help you get thoroughly in the mood for Halloween! 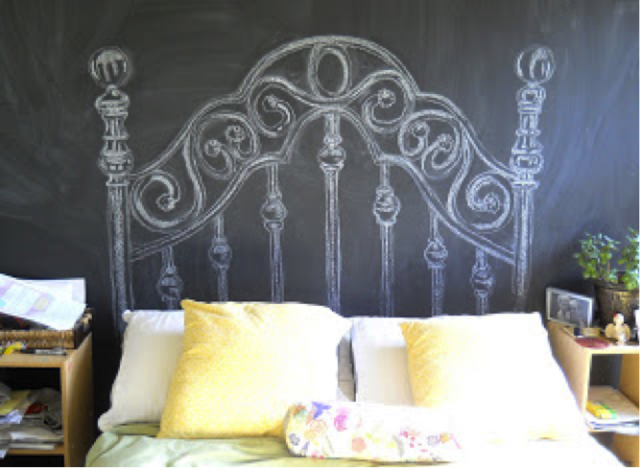 I like the idea of using chalk for a headboard, but the choice of mimicking a traditional brass bed gives me pause. It ups the spooky factor quite a bit. Just imagine waking up to a message from beyond written on that wall! No thanks. Uh-Uh….nope, no way. 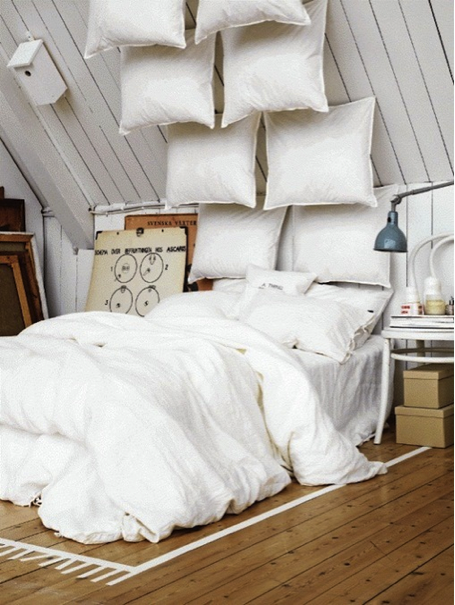 I like objects like pillows to be where they’re supposed to be- on the bed! For me, the scariest scene from any movie was in Poltergeist when all of the chairs suddenly ended up on top of the kitchen table. I shudder thinking about this. I do really love the tape rug in this room though. This last photo comes from closer to home. This is the Edgar Allan Poe room at the wonderful Sylvia Beach Hotel in Nye Beach, Oregon. The Sylvia Beach Hotel is legendary for its literary themed rooms. This room was remade into the J.K. Rowling room two years ago, but my mother and I have fond memories of staying here in 2005. The room was full of character with its blood red linens and Psycho-themed shower curtain. Many characters also slept in this room as evidenced by journal entries found in the dresser. I’m not gonna lie, staying here was creepy, but in a good way. Between the raven staring at me from across the room and the pendulum teetering overhead, I was a little nervous. In the end, we made it through the night unscathed and enjoyed telling others about our unique sleeping quarters at this quaint little hotel by the sea.